This WebQuest is designed to give students an opportinity to explore and discover the characteristics of the 3-Demensional geometric shapes. Utah State Math Core Third Grarde, Standard 3, Objective 1. Geometric shapes can often seem like a mystery. You are going to become a C.S.I detective (Cool Shape Investigator). 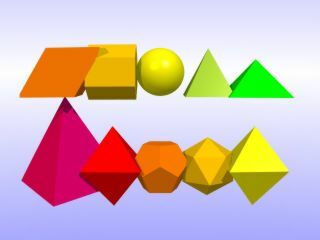 Your first assignment will be an investigation of the properties of a set of geometric shapes. As in all good detective work, the information must be classified into groups and displayed so all your fellow C.S.I.s will understand the concept, and the mystery will be solved!